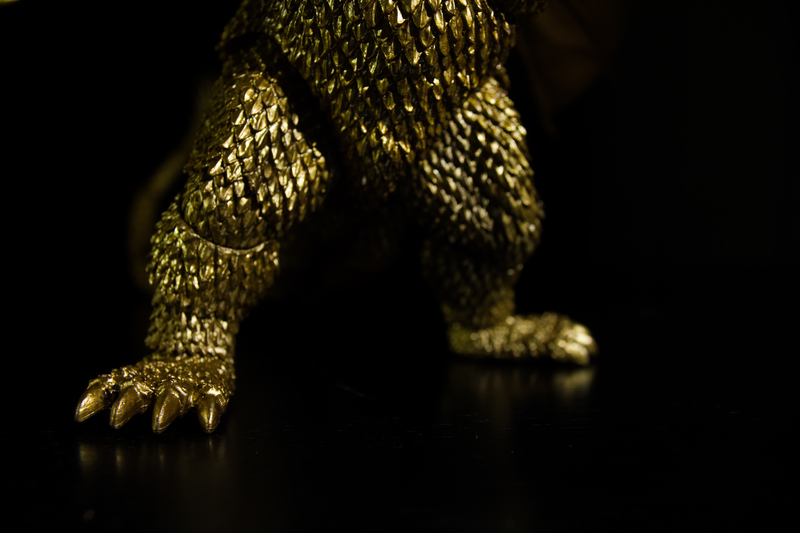 The golden three-headed dragon gets S.H.MonsterArts treatment! 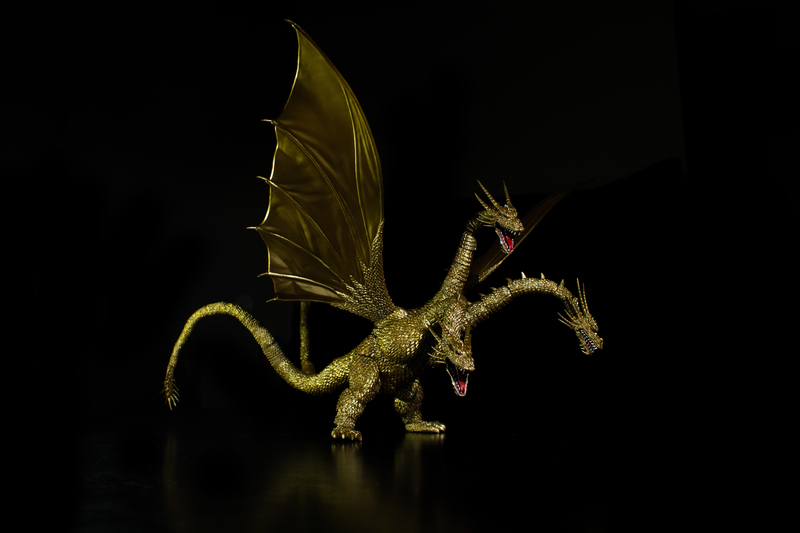 King Ghidorah from the Heisei series is most impressive and some would even argue that it features the best sculpt of this monster yet. That being said, the first batch of King Ghidorahs were released with QC issues, but those were rectified in November and December of 2012. Mass retailers now carry King Ghidorahs that now have a stronger hinge joint for the wings. While this is good news for weary consumers, is the figure worth its $124 price point and aforementioned fragile wings? I’ve seen many King Ghidorah action figures in my time and they all share the same qualities. The body and tails are usually the same shape and length, legs are either bulky or too flat without muscle, wings are too small, and the necks and heads are always goofy looking and cartoon-like. But this all changes with this figure. 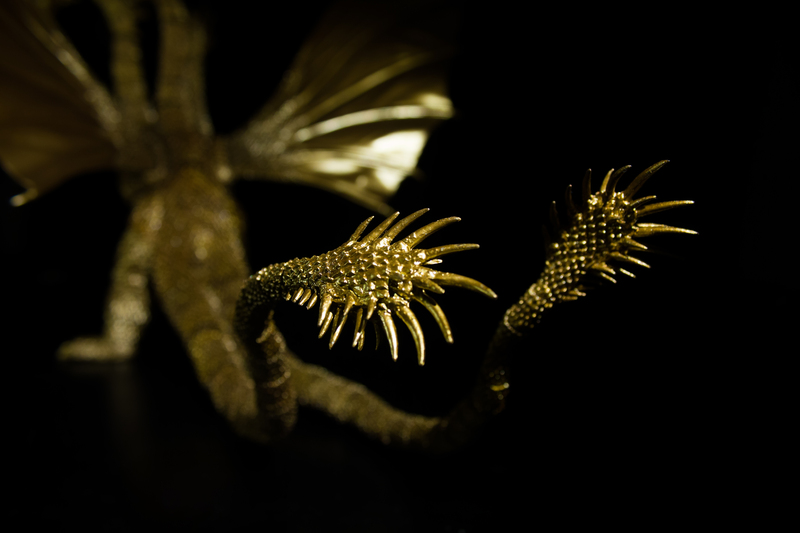 King Ghidorah is sculpted by veteran monster sculptor Yuki Sakai. I have to hand it to him. He really nailed what King Ghidorah looks like. It’s just perfect. My favorite part of the design is the heads. Never have I ever seen the heads sculpted to movie accurate perfection. The teeth, the mouth, the horns, and even the tongue are well represented here. 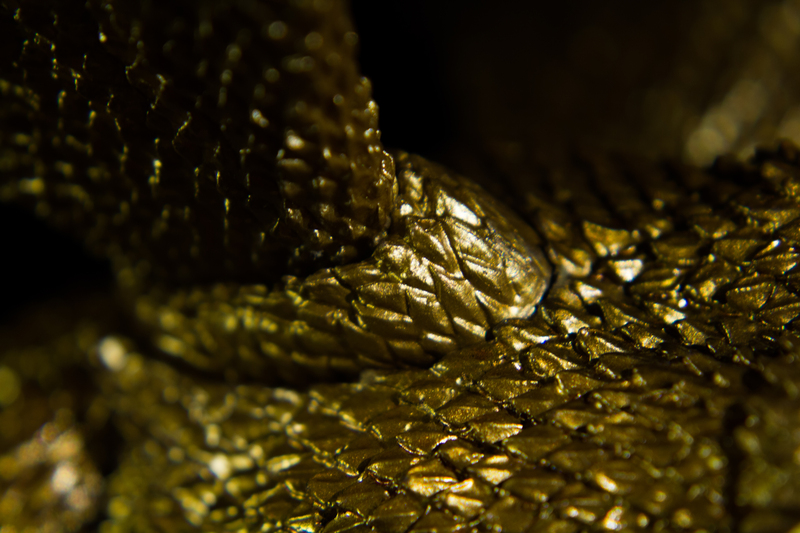 The necks, body, legs, and tail all share the same dragon-like scales, keeping the design consistent throughout the sculpt. 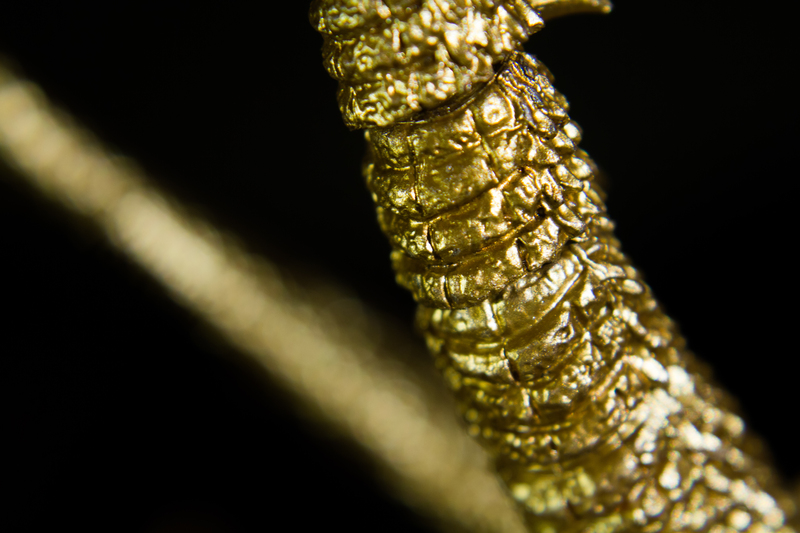 Notably, unlike other toy versions of King Ghidorah, the scales are meticulously sculpted allowing each and every one to be its own unique design. I like how the scales on the chest get bigger and how they become smaller all the way to the tip of the tail. It’s a testament to Sakai’s patience and commitment to deliver quality work. The necks also have a special design that represent the typical dragon armor flaps under the neck. 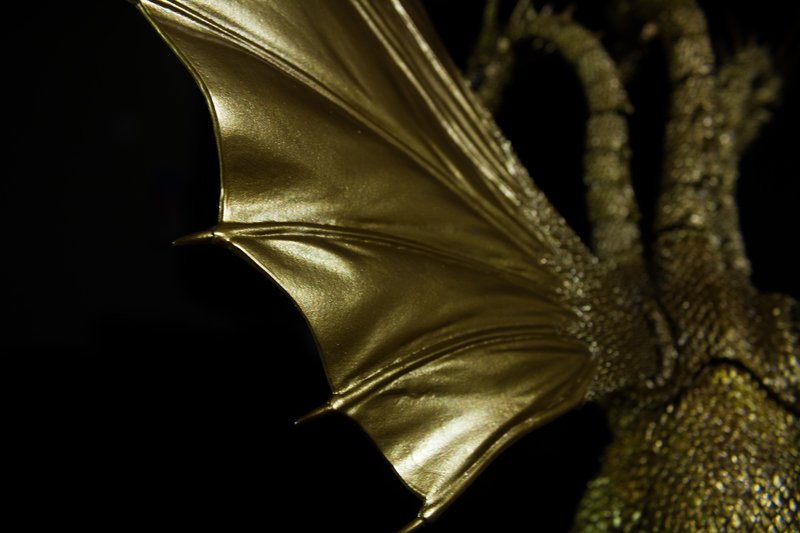 The tails really add some length to King Ghidorah, which can be best demonstrated when King Ghidorah is posed in a flying position. It’s absolutely stunning. 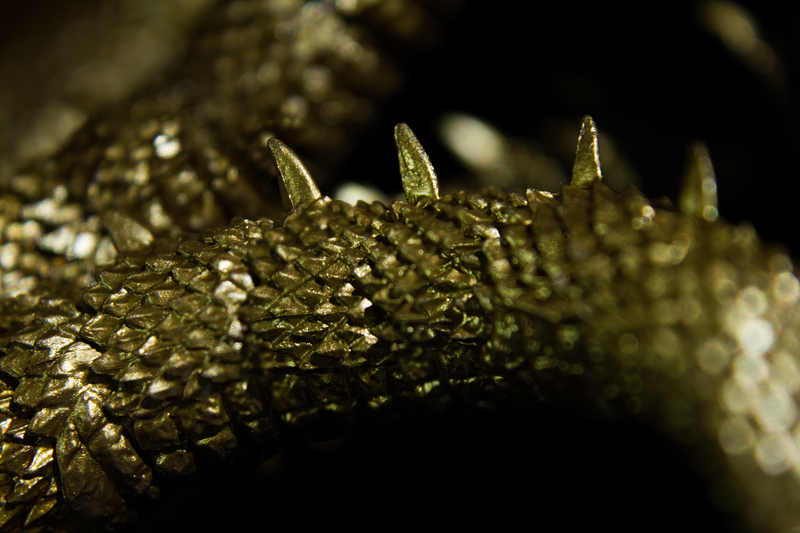 The tips of the tails look like spikes and are extremely detailed with tiny bumps and curves. The wings are another glorious thing in and of themselves. The scales from the body slowly blend with the rest of the wing where, instead of making a flat crisp wing membrane, Sakai manages to add wrinkles and other curvature details that make the wings not look like they’re made of plastic. 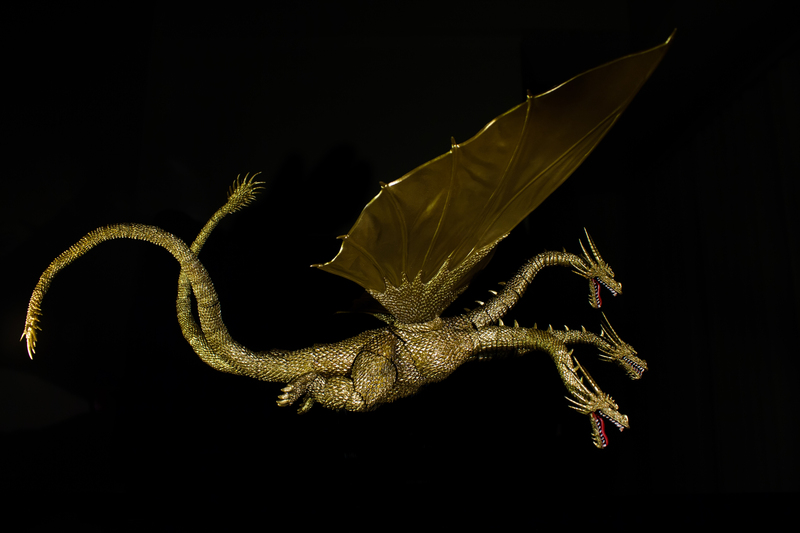 From a distance they could be mistaken as real golden dragon wings. The tips of the wings even have claw-like spikes to add a little touch of danger. What I can appreciate here is that these wings are not dwarfed by the body. The span alone is awesomely huge and really makes King Ghidorah stand out as one of the bigger monsters in the Godzilla franchise. The overall sculpt is perfect. No gripes here. King Ghidorah has a lot to offer in terms of articulation. Articulation seams aren’t obtrusive in the sculpt and the ball joint system creates a natural movement for the three-headed monster. The necks and head are able to bend all the way down to the point where the heads can almost touch its chest. Additionally the necks can be moved in a 360-degree motion and are posable in any position. You can even make King Ghidorah look backwards at a foe lurking from behind while facing another monster in the other direction! The heads can also rotate in a 360-degree motion adding a little more realism to its posability. The mouths open and shut as expected, but with a nice surprise as the tongue can swing left to right. The torso has limited movement in any direction. It can slightly twist left and right and tilt back and forth, but that’s the extent of it. I can understand the reasons for this design decision as the wings are top heavy, so a strong torso is needed. The legs have four points of articulation (so eight in total), connected on a ball joint system. The thigh can be rotated in a 360-degree motion, allowing both a neutral stance and various attack stances. The knees bend as expected. The ankle design is unique as it allows the figure to emulate walking or kneeling. The feet can be rotated left to right, as well as up and down. All these points of articulation also allow King Ghidorah to tuck its legs back to make a flying pose more accurate. The tails boast sixteen points of articulation, each which uses the ball joint system, allowing maximum posability. These joints go all the way to the tip of the tail. It’s absolutely astounding. I don’t know the why other monsters with tails didn’t receive the same treatment. They’re very flexible since there aren’t any protruding spikes to inhibit movement. The tails can curl into the perfect “s” shape and even though they’re very long, they can hold a pose. Necks and wings aside, they’re one of the highlights of this figure’s articulation. The wings are connected using a double hinge system instead of the ball joint system. The wings can be a little top heavy and I can see that if using a ball joint system were in place, it could easily wear out and become too loose to hold a pose. This is why the double joints were introduced. It’s not a bad idea, but the wings themselves are very fragile. I recommend handling them from the base instead of the wing tips while posing, as the plastic toward the top is thin and less sturdy than that at the base. That being said, the wings have a good range of motion from a 180-degree angle to a 90-degree angle. This means the wings can’t swing forward past the body and are limited to a normal flapping motion on the back side. Personally, I would have liked to see the wings have more than one point of articulation and be bendable during flight rather than have the whole wing be one giant piece of plastic. Overall, the articulation doesn’t sacrifice any of the sculpt. The only real improvement I would have liked to see was more articulation in the wings. If I had to choose between land poses and flight poses for this figure, flight easily wins. 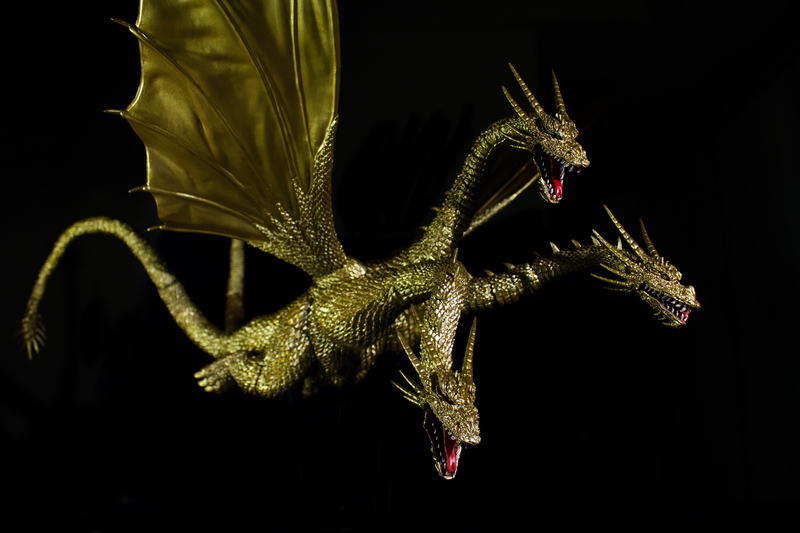 King Ghidorah just looks menacing and you really get a sense of its terror in a flight pose. 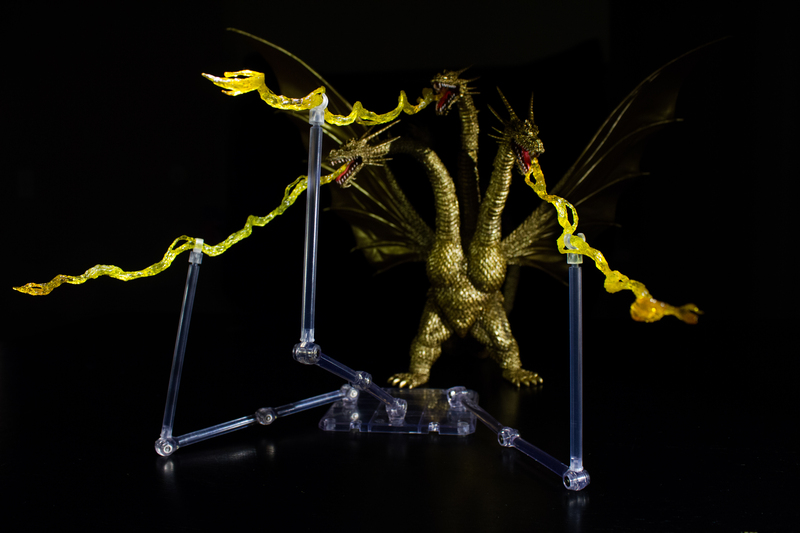 King Ghidorah comes with three yellowish translucent gravity beams and a unique stand to hold them. The stand has three arms that can be even longer using three additional extensions to hold the gravity beams in King Ghidorah’s many poses. Since the beams themselves don’t have holes where the arm of the stands can be inserted, you have to adjust the height of the beams according to the weight of the stand and the pose of the figure so that the stand doesn’t fall over. Not only do you have to balance that out, but the beams have to be placed in the right spot because of their unique shape against the flat surface of the grip they’re held in. Once set up, it really does look fantastic and makes the monster look even more awesome. Other than that, I don’t see any other accessories needed with this figure. It would be cool to have battle damage wings to swap out with the normal wings, but alas, the design is a bit tricky to disassemble and would cause more headaches and breaks than already reported. Though limited, I think there are just the right amount of accessories for this figure. 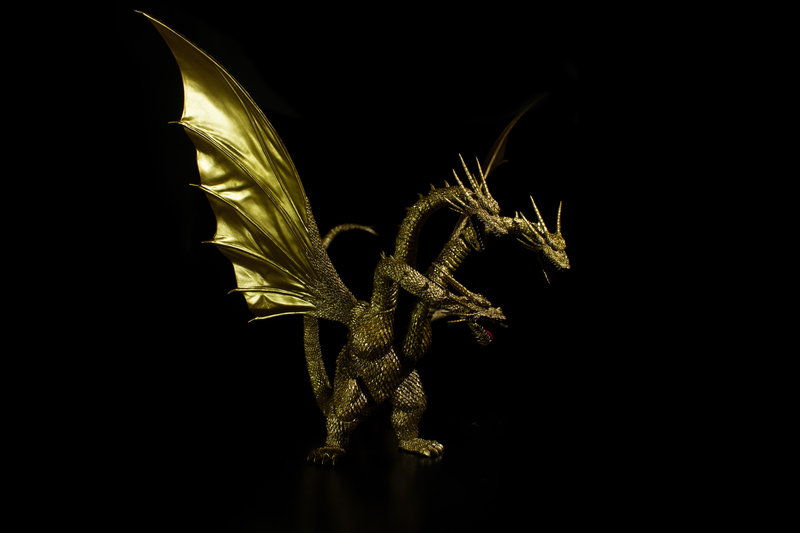 King Ghidorah is an outstanding figure. The figure has many points of articulation and can deliver some stellar poses. Everyone who collects monsters should have it. The sculpt alone surpasses any Heisei era King Ghidorah figure I’ve ever seen. Priced at $124 MSRP, this was the first S.H.MonsterArts figure over $100. My only note to consumers out there is that you should buy this figure new and not used. That way if you do happen to encounter any quality control problems, you can easily exchange it for a new one. Also, when posing the wings, always move them from the base, not the wings themselves. Is it a must have? Absolutely. Do I recommend King Ghidorah? Yes. The paint job is a mixed bag of good and bad, but mainly good. King Ghidorah has some elements that seem difficult to paint in a mass production flow and it shows in some parts. For example, all the teeth are a reddish-white. Either the gums didn’t dry completely or there wasn’t enough white paint applied, making the end result look unfinished. The lower jaw on some of the heads have blending issues resulting in a dark golden-black color. This blending issue occurs in other parts of the figure, usually near crevices and seams. Though I’m bringing these up first, they really have a minor presence. The rest of the figure is a piece of shiny golden goodness. 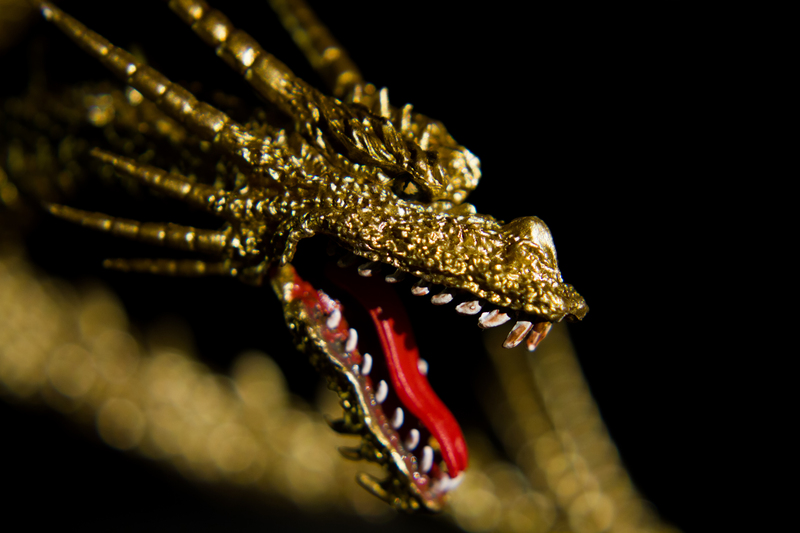 There’s not really much to say as everything is gold except for the nails on the foot, which are blended nicely with a light tannish-yellow color, the gums and tongue, which are dark and light red, the reddish-white teeth, and the eye ball, which is a light tannish-yellow color with a black pupil. 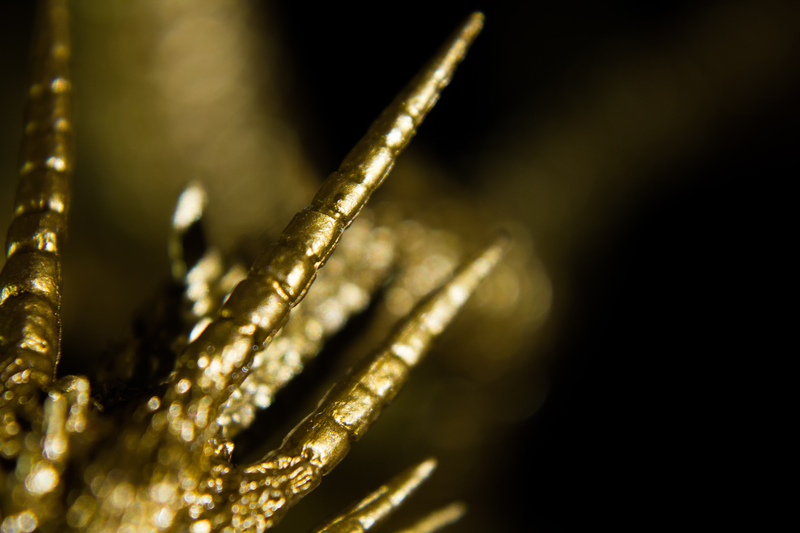 The eye, though small, really has that attention to detail that makes King Ghidorah look menacing from all angles. Overall, the paint job is well done, though a bit sloppy in some of the more curved parts of the sculpt.